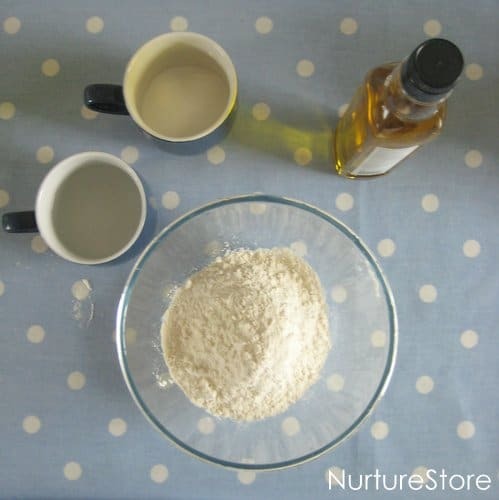 A classic, no cook play dough recipe that you can make in minutes, using ingredients from your kitchen cupboard. 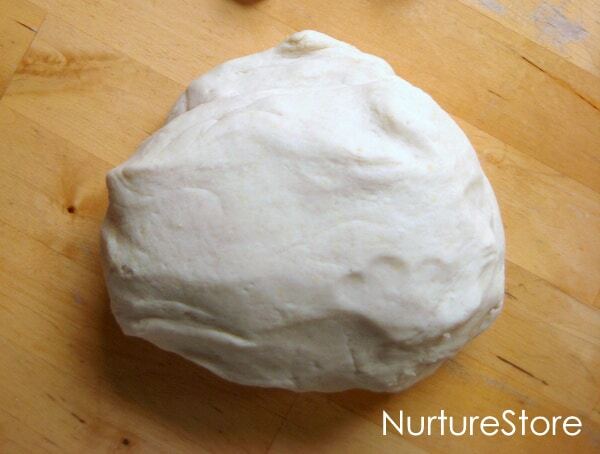 Here’s a step-by-step recipe, along with ideas for a whole year of play dough activities. >>>Download a whole year of play dough ideas here! Nurturestore has lots of articles about fun play dough ideas but I though today I thought I’d get back to basics with a step-by-step easy play dough recipe. It’s a super easy recipe and even if you’ve never tried making your own play dough before, follow these steps and you’ll be ready to enjoy some fantastic sensory play in minutes. I’m going to show you my favourite no cook play dough recipe. 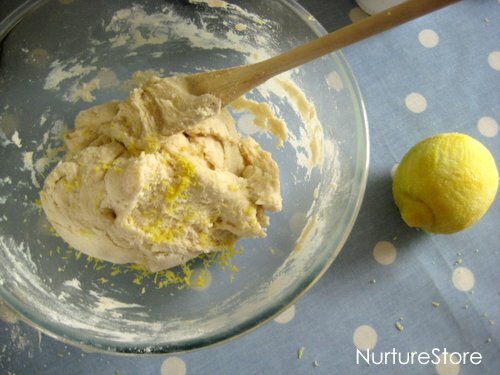 There are many versions and variations of play dough available in our archive of play dough recipes but this is the one I use most often because it’s easy, quick and lasts really well. :: 2 tablespoons cream of tartar*. Step Three: boil the kettle and pour 1 1/2 cups of the water into your mixture. Add in any food colouring at this stage so it mixes evenly through the dough. 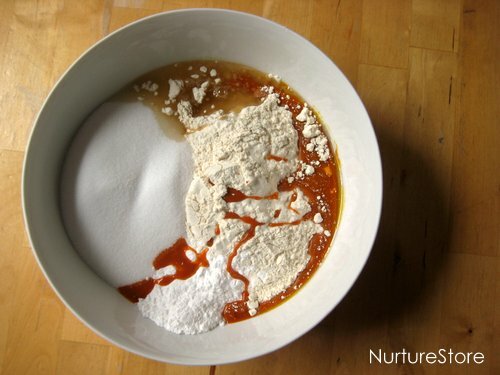 Step Four: mix the ingredients together to form a dough and you are ready to play. Play dough too crumbly? Add a little more oil. Play dough too sticky? Add in a little more flour. Want your play dough to last a long time? Wrap it up well in a plastic bag as soon as you’ve finished playing and your play dough could last for months. * Not got all the ingredients? If you discover you have no cream of tartar, no problem – just leave it out. You can make a basic dough just by combining flour and water if that’s all you have. The dough won’t last but will give you a great day’s worth of play. Also my favorite receipt 🙂 My children loved it! And it makes a great and cheap present for birthdays. We also add 2 table spoon of liquid gycerin. It makes it even smoother. Thanks for the glycerin tip Reina – I’ll have to give that a try next time. Right, I don’t let my kids play with playdoh often enough so I am making this tomorrow! I’ll have to try your no cook recipe! I love that you’ve compiled the tips and tricks. I love homemade play dough and now I’ll never go back to store bought! 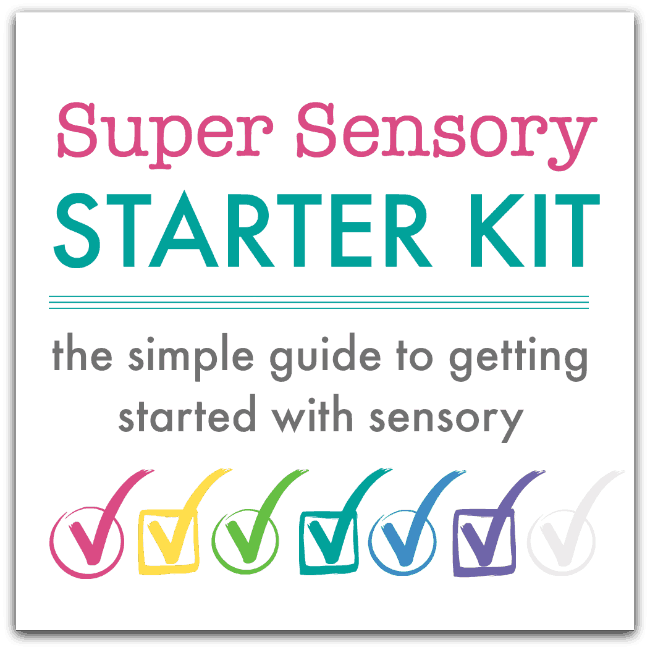 What a great resource thank you for compiling it all and the ebook is great I remember downloading that when J stopped eating the dough and we started with some adaption of the ideas then. 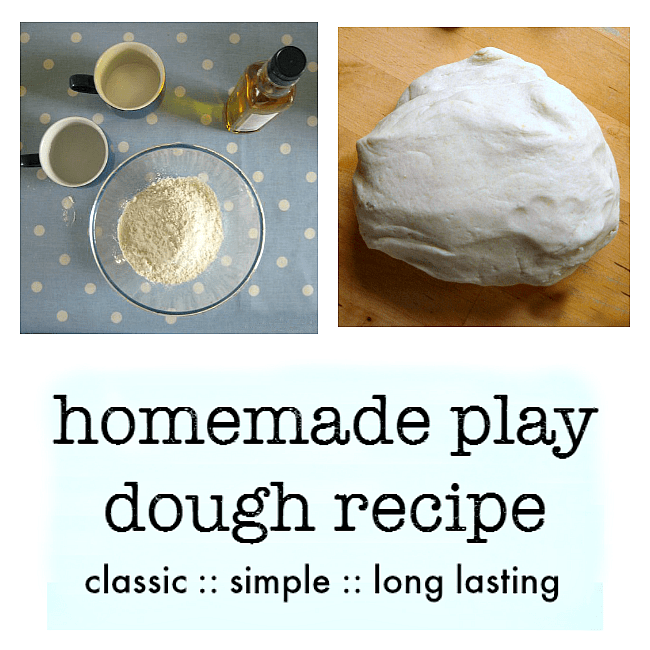 This is a brilliant recipe – this is the first time i have successfully made playdough – despite many attempts. Thanks so much. Hurrah The Monko! I’m so glad my recipe worked for you. I see lots of happy play dough making in your future! I love the playdough ‘master class’ concept and what great pics!! I am often suprised when people comment on how ‘good’ i am to make playdough for the twins….but it’s just one of those things you can have so much fun with as you have illustrated so well. This recipe is very similar to my microwave recipe which i use all the time. Thanks so much for sharing your inspiration and linking up to(and hosting!) the Weekly Kid’s Co-Op! Hi Jode. I hear you! I think people don’t realise just how easy it is to make your own. Thanks for the no-bake recipe! Aodhan and I needed a new batch today and I wanted to avoid the mess of the pot – so thanks so much for this. Everyone needs to see this to realize how incredibly easy making their own PD truly is. Thanks lyndsay. I feel rather evangelical about this recipe! Hi Maddies mom. If you use this basic recipe with no extras (so no glitter) then all the ingredients are food – and so edible. Obviously you’re not going to want your baby to tuck in (lots of salt in it) so, as you’ll be supervising all the time, you can make sure they don’t eat any and re-direct them if they’re tempted to. A gentle reminder not to eat and a suggestion for something else to do with the dough can work. And having some other things such as cookie cutters to occupy hands can be a good too. If your child is really in the mood for eating though, you might need to switch to a messy play thing which is totally edible – such as mashed potatoes or pasta. Following along with the Playdough Pledge this week… I generally make the stovetop playdough as I hadn’t had good luck with “no cook” kinds. We tried this recipe yesterday and the kids enjoyed taking mastery of their own recipe (I split the recipe in half and had them each make a bowl). It seemed a little harder / saltier on my hands for the first big knead and first couple minutes of play, but after that we didn’t have any problems with it. Thanks for sharing the recipe – I’m sure we’ll be using it again! I used white whole wheat flour and added cinnamon. It reminds us of sand so we’re having a day at the beach! I didn’t have cream of tartar, but it seemed to turn out fine. What is the C of T for anyway? Oh, and we put gold glitter in it too. Jessica, I believe the cream or tartar, as a raising agent, affects the consistency of the dough. But as you say, you can make a perfectly good dough without it. Your day at the beach sounds fun! I’m looking for dough that dries pretty (salt dough looked horrible when it dried. Will this recipe dry nice? Every time I’ve made the salt dough, it dried all mottled. 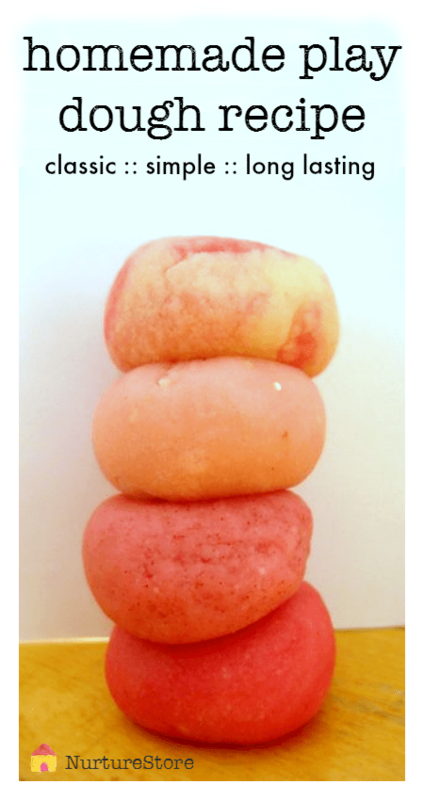 W used food dye to color the dough itself and never painted. The girls want dough that we can color (not paint) and have it dry with vivid color. Sounds like a great experiment. Did the colour stay as it was or fade? Food gel colours could maybe give a stronger colour? They faded quite a bit. I’m actually making your recipe right now and am about to put the coloring in 6 different balls of dough 🙂 We’ll. See how it turns out after girlie makes a charm! Hope you’ll let me know how they turn out dawn. That’s so lovely to hear the monko. My 10 year old still loves play dough just as much as when she was three. It’s so interesting to see how her play has got so much more intricate. She makes amazing models with it now. HI! I was wondering what you mean by ” boil the kettle?” Thanks for you response! I have used the cream of tartar recipe for almost 40 years. I usually like to make a new color every month, but found it hard to keep one batch moist enough until the next month arrived. With daily use (sitting out for almost two hours each day), it eventually dried out. A couple of years ago, I discovered that if you wrap the dough with a wet washcloth overnight, kept in a baggie, it will soften up almost like new for the next day. You will have to knead it again in the morning, since it will appear “slimy” after sitting in the cloth overnight. Great tip Christine, thank you. I always keep ours in a baggie, but haven’t tried the washcloth tip before. Thi is a recipe that I have been using for a long time,and it’s great! Now I am unable to buy cream of tarter,is there a substitute that can be used insted? Hi GLoria. You can completely leave out the cream of tarter – I often do! Your play dough might not last quite as long, but I haven’t really noticed any difference. Hey, I don’t have vegetable oil bit can I use Canola oil? Thanks! Hi Marisa. Yes, that should would just as well. Step 3 states to ‘boil the kettle’. I’m not sure if I am over thinking this or what, but I am so confused on what to do there! It says, no cook so boil what kettle? There’s no photograph of a kettle either, so I’m thinking this was accidently added as a step? As far as keeping the dough, do you wrap it in a baggie and leave it out (at room temperature) or put it in the fridge? Hi Nancy. I wrap ours on a baggie and keep it at room temp. You can put it in the fridge but it will need a bit of extra kneading before your play. There’s plenty of salt in the recipe so I find it keeps well out of the fridge.